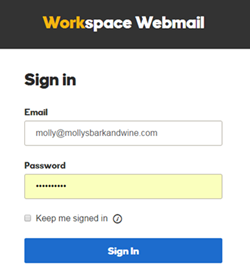 After you set up your Workspace email address, you can login to your email account online through the Workspace Webmail login page. Enter your Workspace Email address and Password. Note: After you've set up DNS, you can also login by going to email.yourdomain.tld (e.g. email.coolexample.com). Looking for Office 365 email account login info?